For those who haven’t hear this word before, a rickshaw (in Japanese: jinrikisha 人力車 ) is a two wheeled passenger car pulled by a man, on which you can enjoy a great view of the town, comfortably seated. And if it happens to be winter, sit-warmers and blankets will be provided! 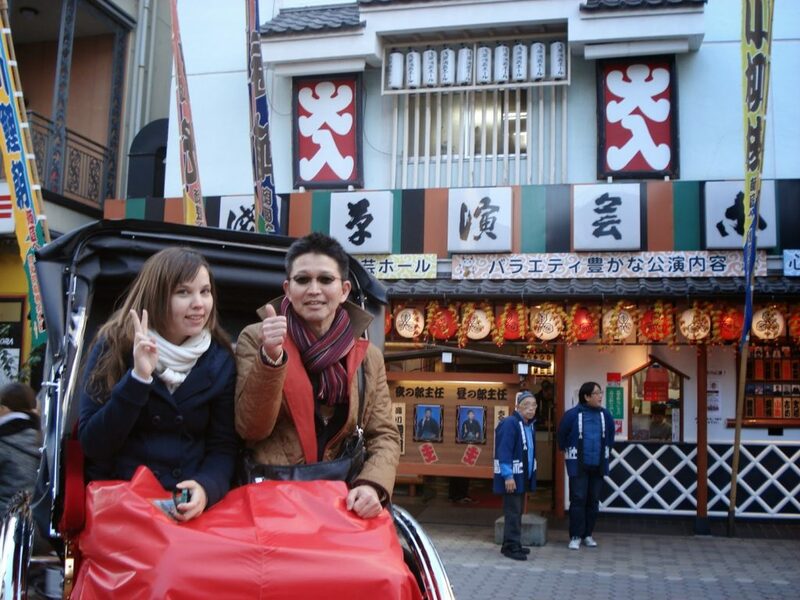 Although I’ve visited Asakusa before, almost everything I got to see through the rickshaw was new to me. In fact, you will not only see classic tourist spot, but discover what quiet streets can offer. 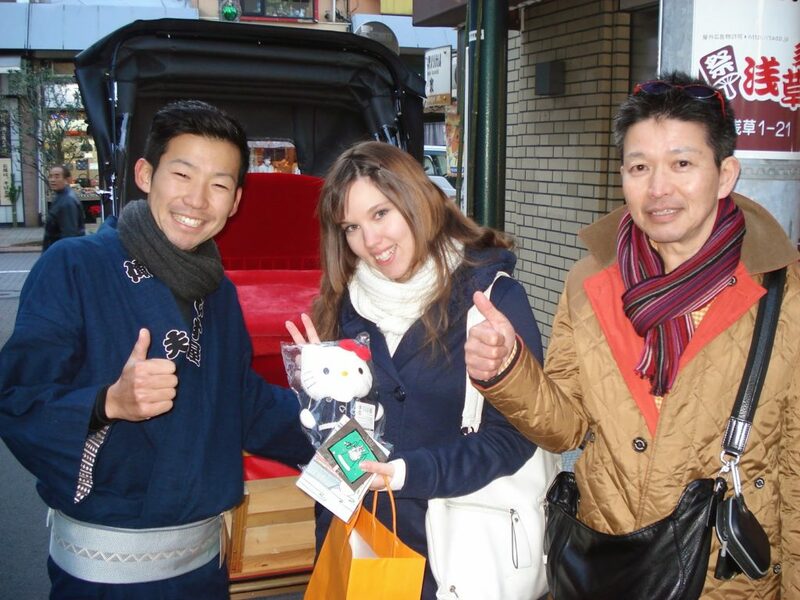 During our trip we visited places like Asakusa Orange Street, the Engei Hall and the Geisha Town. If you don’t know what these places are about, don’t worry, because the rickshaw runner will also be your guide, in English! For example, I didn’t know that right after the big Sensoji Temple there is the oldest amusement park in Japan: Hanayashiki, which has a funny story you can hear about. The tour is not only about being sit and listening to the guide explanations. In fact, we even stopped at Matsuchiyama Temple, a peaceful spot where you can learn how to be symbolically purified in order to enter a sacred place ( like hand washing procedures ) and make a wish for your future. Along the way you can take as many picture as you want, moreover there will be a few spots were the car will be put down and you can have a picture taken by the guide, in order for you to have a beautiful memory of the experience with a typical Japanese background. and not only. For example, in my case the guy who drove the rickshaw knew a bit of Italian and we could even talk about his experience in my county. He was really nice and honest! If you want to be sure to be guided in English, I recommend you to book in advance on their website, where you can have a look at the services and prices too.There are options for every budget, starting from 4,000 to 40,000 ¥ . The most popular one is the one hour round trip, which allowing you to see different spots and to visit the Matsuchiyama Temple is totally worth it. Once you get on, having so many things to look at, time flies! But if you are travelling with a low budget, having a 30 minutes or less trip is also possible. Also, if you are short on time there is the possibility, arranging it previously with the kind staff, to get off on a different place from the starting point. Whether it is a short or long trip, don’t hesitate but enjoy this unique satisfying experience! 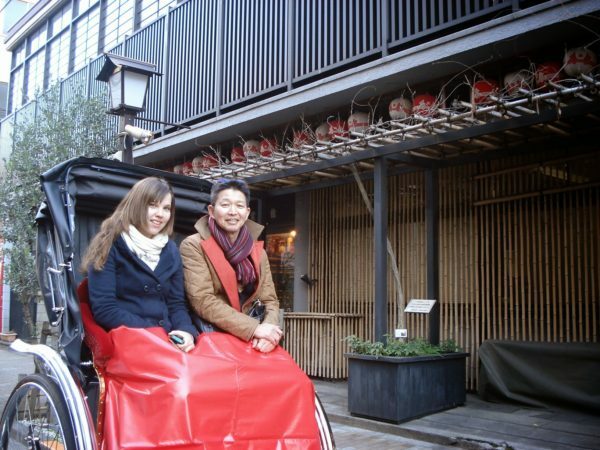 Riding a rickshaw around the old but at the same time modern Asakusa area will make you taste the ancient Japanese tradition mixed with the feeling of being special in the contemporary Tokyo. If you have questions or specific requests, don’t hesitate to ask the stuff, they will happily try to accommodate your wishes. So, if you have the chance to, don’t hesitate but enjoy this unique experience!